As the title indicates, I have posted this little blurb before, but since I find that I return to the concept again and again, even transcribe it into my journals again and again, I’m okay with posting it again. It so describes my experience, perhaps now more than ever, and every time I return to it, I get something more out of it. Something different. Right now, it goes along with — helps to explain and confirm — the need to “find a place for my mind.” A place where it can be uncluttered with demands and desires and just the general detritus and ephemera of various thoughts that come out of continued contact with our “too fast/too much” world. 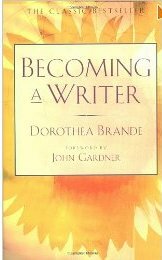 As the picture above indicates, this is from Dorothea Brande’s classic Becoming a Writer, which was first published in 1934. “[The writer] will only know that there are times when he must, at all costs, have solitude; time to dream, to sit idle. Often he himself believes that his mind is empty. Sometimes we hear of gifted men who are on the verge of despair because they feel they are going through a “barren” period; but suddenly the time of silence is past, and they have reached the moment when they must write. “That strange, aloof, detached period has been called “the artistic coma” by observers shrewd enough to see that the idleness is only a surface stillness. Something is at work, but so deeply and wordlessly that it hardly gives a sign of its activity till it is ready to externalize its vision. The necessity which the artist feels to indulge himself in solitude, in rambling leisure, in long speechless periods, is behind most of the charges of eccentricity and boorishness that are leveled at men of genius. If the period is recognized and allowed for, it need not have a disruptive effect. Well, I don’t know about the “under one’s control” part, but certainly recognizing this and allowing for it is very helpful. That sounds wonderful to me! Like water in a desert. And it also happens to coordinate with some of the concepts Pastor Farley taught awhile back about God is at work in us, often in those times when it seems He’s not hearing, when things are tough, or just nothing is happening, nothing is changing outwardly, perhaps it’s in our life situation, or maybe it’s internally, but if we know we are in His plan and obeying His commands, we know that He is at work. That’s what I’ve begun to see is going on with me and this book. He is at work on my character and person for one — at work in my relationship to what I’m doing, how much control I’m going to have over it all, and what His part is going to be. He’s teaching me that this is His project in all respects and I really just have to stop trying to take the reins. Which I do over and over and over. And part of how I’m seeing that is through what He is doing with this book. Working slowly, silently, below the surface. Brande’s description is so much like what I’m experiencing… and it’s so not what the world says it should if God is involved. Especially if God is involved. I’ve read so many Christian writers relate how they prayed and He just poured the story into their heads. He does do that with me. Sometimes. In fits and starts. Never the whole story, though. And always with lots of “dry” periods between. But this week, a number of things have fallen into place and I feel more encouraged than I have in months. Brande’s quote was one of the things that led me back into the sun, as it were. This entry was posted in Creativity on November 15, 2012 by Karen Hancock. You sound so much like me. I love reading your blog because it makes me feel not so alone. God is “rewriting” some of my old stories but slowly, I think because I haven’t yet learned all the lessons He wants in there. I feel like I’ve been working on the same projects for years, but really it’s just the same characters with deeper story lines. Sometimes it’s so big, I feel lost in my own story and unsure how to tie it together. Sometimes I feel like I’m taking over and will have to “redo” everything all over again.